Three Quarterbacks Chosen in NFL Draft First Round! Blake Bortles of Central Florida came out of the Sunday NFL Scouting Combine as the “Big-Winner” at Quarterback, but both Johnny Manziel of Texas A&M and Teddy Bridgewater of Louisville were obviously great Quarterback Prospects and on Thursday were Drafted in the First Round of the NFL Draft. Bortles shocked everyone when the Jaguars Drafted him as the Third Overall Pick. 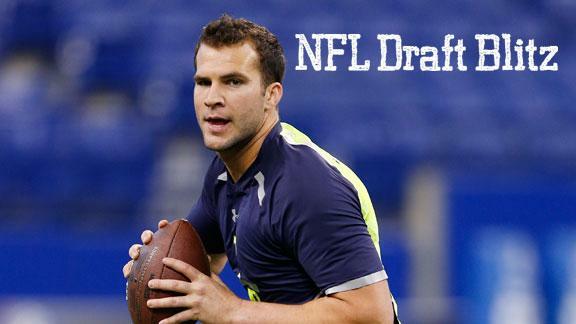 With Manziel and Bridgewater not participating, in the NFL Scouting Combine, Bortles took full advantage and really “Wowed” most of the NFL Scouts. Bortles took advantage and convinced everyone that he was a legitimate Franchise quarterback. Bortles also impressed me and most all of the NFL Scouts with his Strong Arm and Athleticism with a Great 32.5 Vertical Jump, an outstanding 4.21 Pro-Shuttle, and a great 115 Standing Broad Jump. Both Manziel (On Right) and Bridgewater (On Left) had been two of my favorite Quarterbacks this past year, but they had received some very bad guidance from one of their Coaches or Agents, because they were recommended not to throw at the NFL Scouting Combine Workout. Manziel waited until the #22 Overall Selection to get his name called by the Cleveland Browns, but most of the Cleveland Brown FANS were pretty excited about his Selection. Then Bridgewater got to hear his name called by the Minnesota Vikings on the #32 Selection Overall. I still like several Quarterbacks for Friday or Saturday, including Derek Carr (In The Middle of Photo), Jimmy Garoppolo, and A.J. McCarron, and probably in the Early Rounds on Friday or Saturday.